My fascination with modernism (doesn’t that term sound old-fashioned)—let me rephrase that—forward-thinking art never seems to diminish. Call me lucky (I think I am), but as we add new works to Davis Art Images image collection, I routinely see works that are my daily or weekly “wow” moments. As I get older more mature, I find it easier than ever to appreciate art movements that I used to turn a blind eye to. One of those movements is Minimalism. Being a painterly landscape artist, I appreciate the ability to tame the urge to overwork a subject or go to town wasting medium (of which I’m always guilty). Minimalism was a movement that resulted as a reaction to the emphasis in western art on gestural abstraction of the 1940s and 1950s. Ironically, initially it emerged from Abstract Expressionism as color field painting, an often expressionistic alternative to the splatter, drip, and slash vein of the New York School. From artists such as Clyfford Still, Mark Rothko, and Barnett Newman emerged artists whose work defined the elimination of the trace of emotion, symbolism, narrative or personal signature. David Smith (1906–1965) was a sculptor from the New York School who pioneered pure minimalism after producing somewhat active abstract sculpture in the 1950s. Along with artists such as Sol LeWitt and Tony Smith, Carl Andre is one of the true pioneers of minimalist sculpture. He studied art in Andover, MA and moved to New York in the 1950s. In the late fifties he became associated with the studio of pioneer minimalist Frank Stella, while developing his own sculptures and drawing. Stella’s work was a major influence on his own mature style. What cemented his ideas was a visit to Stonehenge in the early 1960s. Andre’s concept of minimalism stemmed from his interest in building multiple units. In the early 1960s, Andre created pieces by carving blocks of wood. He soon progressed to building pieces of multiple units of finished wood, such as this piece. He then moved on to what he is best known for, using multiple units of either manufactured materials (such as cement) or metal. His large arrangements of metal plates placed directly on the gallery floor were a sensation in the 1960s. He encouraged viewers to walk on them, revolutionizing the perception of participatory museum experience. This lovely piece contains all the aspects of minimalism I adore: the symmetry, pure geometry, and reverence for the material. Such respect for the material can be seen in works by other artists whose abstraction is pared down to simple forms. 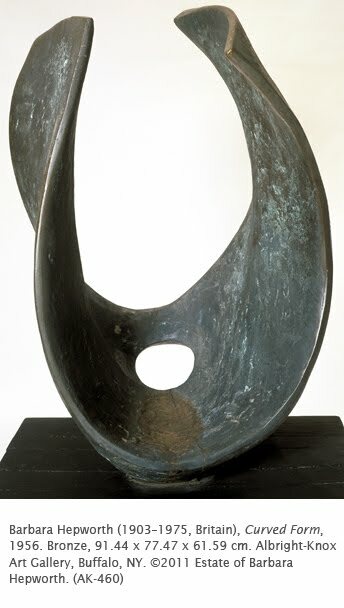 One who comes to mind is Barbara Hepworth. While organic, her forms beautifully mirror the same intent as Andre’s. New Acquisitions Month: Yucky Still Life?